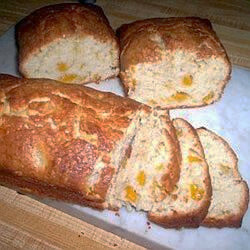 This homemade peach bread recipe is fantastic. I love peaches and bread and when I took my first bite of this I couldn't believe how good it really was. Then I started exploring with it and it was delicious with a few chopped nuts and cinnamon. A brown sugar and pecan glaze drizzled on the top takes the flavor over the top. Wonderful toasted with butter and cinnamon on top. The fun part is knowing you can do this with your favorite fruit. I love the homemade strawberry bread. It is a favorite at our house. Check it out, it may soon become your family's too. The photo doesn't do this bread justice (sorry). Offering many fruit quick bread recipes for you to call your own at the bottom of the page. So sit back, grab a cup of coffee and browse through these homemade bread recipes - Enjoy. PREHEAT oven to 350 degrees. Grease a loaf pan and place parchment paper on the bottom of the pan; spray with vegetable oil. In a mixing bowl, cream butter and sugars. Add the eggs, one at a time, beating well after each addition. Beat in vegetable oil, vanilla and almond extracts and peach schnapps. Stir in peaches. Combine cinnamon, flour, baking soda, salt and baking powder; divide into thirds and gradually add to the creamed mixture. Mix well after each addition. Pour into the prepared baking pan. Combine topping ingredients; sprinkle over batter. Bake for 50-55 minutes or until a knife inserted near the center comes out clean. Cool or 10 minutes before removing from pan to a wire rack. I really do adore these quick bread recipes. Especially when fruit is added it really is a nice change to plain old loaf of bread. Great item to have on hand during the holidays.